The New Humanitarian | EU migration plan "dangerously incomplete"
EU migration plan "dangerously incomplete"
Irregular migration into the European Union is on the rise and the task of coming up with a new plan to better manage the surge has fallen to the European Commission. It is an unenviable task. There were 278,000 irregular border crossings in 2014, nearly triple the previous year’s figure, according to Frontex, the EU’s border management agency, but member states have been unable to muster a collective response. Italy’s Mediterranean search-and-rescue operation, Mare Nostrum, was discontinued late last year after saving over 150,000 lives, because other EU countries were unwilling to share the nearly US$10 million a month cost. Meanwhile, Germany and Sweden have taken in far larger numbers of Syrian asylum seekers than other member states such as the UK which has accepted only 90. As UN Special Representative for International Migration and Development, Peter Sutherland, wrote earlier this week, there is an “imbalance of commitment and compassion within the EU”. However, based on an outline released on Wednesday of the four main areas of the agenda that the Commission expects to focus on, there are already some worrying omissions. The most glaring one, Amnesty International was quick to point out, is the absence of any plan to replace Mare Nostrum with an EU-wide search-and-rescue mission. During 2014, when Mare Nostrum was still operational, as many as 3,500 migrants died or went missing in the Mediterranean, according to the UN Refugee Agency (UNHCR). So far in 2015, another 370 people who risked the crossing despite rough winter seas, have perished or gone missing. A Frontex-led operation called Triton started when Mare Nostrum ended, but was never meant to replace it and has been far more limited in geographical scope. “Without a collective and concerted rescue mission, the European Agenda on Migration remains dangerously incomplete,” commented Iverna McGowan, Acting Director of Amnesty International’s European office. 1. A strengthened common European asylum system - The Commission says it will work to ensure that “all divergences in national asylum policy practices disappear”. It is a lofty and vague goal considering that a truly harmonized EU-wide asylum system has remained unattainable for over a decade. Refugee recognition rates and reception conditions for asylum seekers still vary widely from one country to the next. Stefan Kessler, senior policy officer with Jesuit Refugee Service (JRS) Europe, noted that the Commission makes no mention of finding alternatives to the Dublin Regulation, which is used to return asylum seekers to the first EU country where they registered a claim. The result has been thousands of asylum seekers being transferred from northern European countries such as Germany and France to “frontline” states such as Italy and Hungary with already overwhelmed asylum systems. Some countries are also more likely to detain irregular migrants and asylum seekers than others, another issue that has not been flagged by the Commission. 2. A new European policy on legal migration - Migrant and refugee rights groups have long been calling for more legal migration routes into Europe so as to reduce the flow of migrants and asylum seekers risking illegal routes in search of protection and a better life. But the new policy on legal migration outlined on Wednesday promises only to address high-skilled migration – “how to attract the right talent to be more competitive at a global level”. For Kessler, this represents the most significant missed opportunity. “It does not take up our call for safe and legal ways to protection,” he told IRIN. “There is no mention of increasing the numbers of refugees accepted by member states for resettlement or allowing asylum seekers to apply for humanitarian or family-reunification visas from outside the EU, just two of the ways in which asylum seekers could gain much safer, legal access to the EU. 3. Enhancing the fight against irregular migration and trafficking – Ana Fontal of the European Council on Refugees and Exiles (ECRE) points out that the Commission has so far failed “to make the link that refugees will continue to have to use smugglers because they have no other alternatives to reach safety in Europe.” The outline agenda does mention further collaboration with origin and transit countries and discusses building on existing readmission agreements. Such agreements allow the EU to return irregular migrants to countries at its borders such as Turkey and Tunisia. “There are no effective human rights safe guards in these agreements and no mechanisms for monitoring what actually happens with people who are returned under these agreements,” said Kessler. 4. Securing Europe’s external borders – The final focus area for the new agenda is likely to be an easy sell to European voters. It is the one area of migration management that member states seem happy to fund. Frontex was created 10 years ago with an annual budget of around US$20 million. Its budget for 2015 is US$125 million, a 16 percent increase from 2014 and the Commission’s outline agenda mentions the possibility of a further increase. 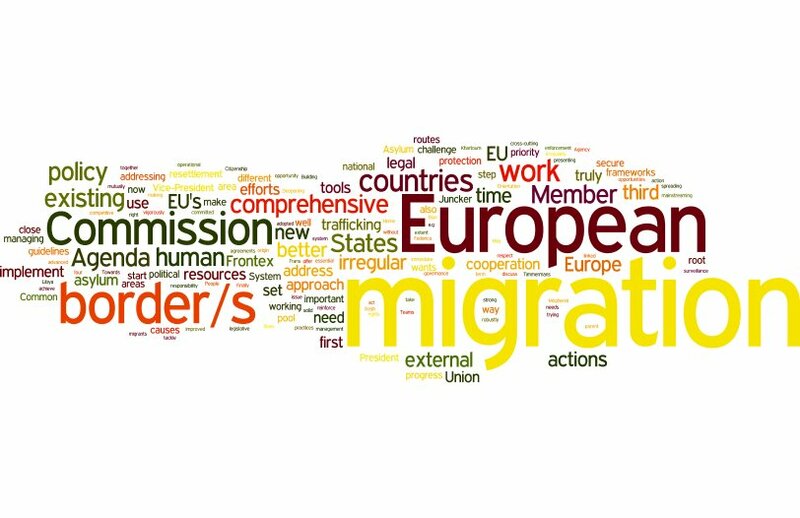 The European Agenda on Migration will only be finalised in mid-May. After that the most important missing ingredient may be political will. “All of these proposals, the [member] states pick up what they want, which is usually more border control but not the possibility of opening legal channels,” said Fontal of ECRE, pointing to the example of the Task Force for the Mediterranean, set up by the European Commission in the wake of the Lampedusa shipwreck in October 2013 that claimed hundreds of migrant lives. One of the stated aims of the Task Force was to create more legal channels to Europe, but in practice implementation has focused on more readmission agreements with third countries and reinforced border surveillance. “What we need is increased political will and even in the case of search and rescue, it isn’t there,” Fontal told IRIN. At a meeting to address mixed migration by sea hosted by the UN’s International Maritime Organisation in London on Wednesday, commercial ship owners reported that they are struggling to cope with the financial and security costs of diverting increasing numbers of their vessels to rescue migrants at sea. Speaking at the same meeting, Volker Türk, assistant high commissioner for protection at UNHCR said: “there is no avoiding that the most pressing need—in the Mediterranean, but also elsewhere—is for a robust State-led international search-and-rescue operation with a clear humanitarian and life-saving mandate”.